THE City Government of San Fernando held this year the second edition of the cooking challenge among its employees on March 15 at city hall in a bid to continuously promote health and wellness in the workforce. The teams prepared several gourmet Filipino “a la carte” appetizers, main courses, and desserts, with kalabasa (squash) and puso ng saging (banana blossom) as their dishes’ main ingredients. Squash is widely-known for its health benefits, as it fights infections and promotes healthy lungs and vision. Banana blossom has the ability to cure infection, cancer, and several diseases. The winning team was “Team Happy Lang,” which was composed of employees from City General Services Office and City Engineer’s Office with their recipes: Squash-Banana Blossom Creamy Soup for appetizer; Chicken Pastel with Squash-Banana Blossom sauce for the Main Course; and Squash-Banana Blossom Pudding for dessert. The team met all the challenge’s criteria, with points on the dishes’ nutritional value, taste, originality and creativity, with additional scores on the cost friendliness, visual appeal, and over-all presentation. 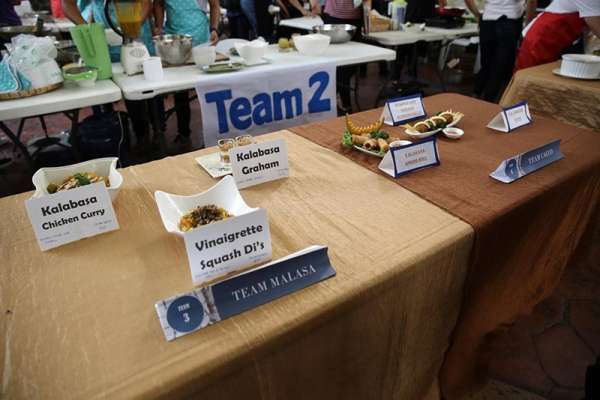 “Team Happy Lang” was joined by other winning teams, “Malasa Group” and “La Filipina Taste” which prepared Vinaigrette Squash Dish, Kalabasa Chicken Curry, and Kalabasa Graham and La Filipina Taco, Dorado Fi-To Ala Pobre, and Postre de Calabaza with Banana Blossom on top, respectively.